Montserrat is a massif located at only 50km from Barcelona. Due to its proximity, its peculiar spires and spectacular walls, it has always been considered one of the favorite climbing schools among the Barcelona and Catalunya climbers. It was also in Montserrat where my father, „Novato“, started climbing more than 45 years ago, when the climbing gear were rigid boots and hemp ropes. At age 12, I was already climbing all the seventh grade routes at that same place. Montserrat became my playground, my school. I come back to this magic mountain twenty years later with my dad to repeat its most difficult multi-pitch line: Tarragó, opened more than 15 years ago by the catalan climber David Tarragó and freed by the Pou brothers in December 2013. 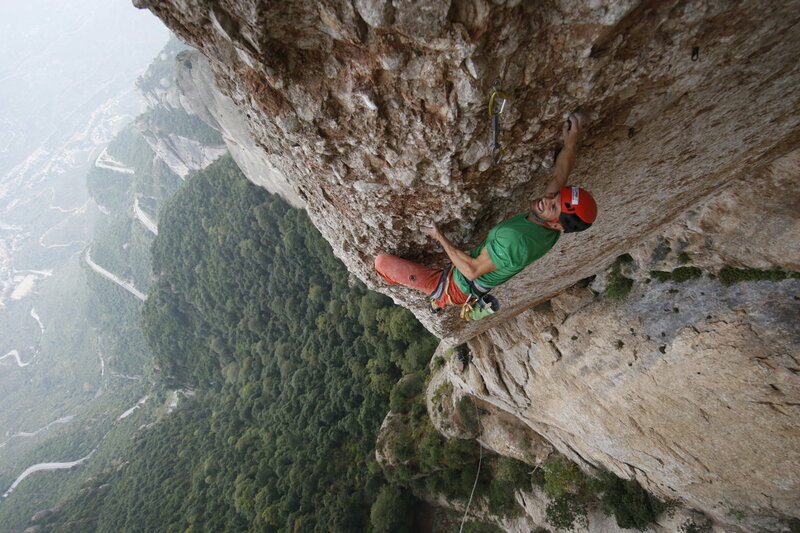 This route, with its impressive abyss and extreme difficulties (8b+/240m) had not seen any repetition since. We had to invest a total of five days to free it, as we had to spend some time cleaning and brushing it. It had been so long since anyone climbed it that it was very dirty. Finally, on 02/10/2016, belayed by my father, I achieved the first repetition. It is one of the most amazing routes I have ever climbed, aesthetically perfect, very aerial and exposed. You find choss everywhere and you have to get used to it in order to climb with serenity. After freeing Tarragó, I thought that it would be best to join pitch 4 (8a) and pitch 5 (8b+), as the anchor was situated in the middle of a very difficult sequence. It was logical to me to rest after, not during that crux. The fight was a hard one, as the weather didn´t help. We had to fight against heat and humidity. The ropedrag was huge due to the 55 meters resulting of the joint pitches. I could feel the abyss swallowing me on the crux sequences, I felt heavy and with no energy. But I stopped my negative feelings and concentrated on the good vibes that this amazing massif had given me through all these years. It was a very, very happy moment. One of these wires where you stand to lose, but yet you win. One of those beautiful and long battles that you don´t know, until the very last minute, if they will end well. These are the ones that make me tremble with emotion! Minutes later my dad arrived at the anchor…what a moving moment…20 years later we were back there…together. We decided to baptize this route as Tarragó Plus due to the connection of pitches 4 and 5. First repetition of the Tarragó route. 8b+/240m. El Plàtan. Pared de Diables. Montserrat. Variation of the last route by joining two of its crux pitches.